I recently purchased two Arty Z7-20 boards and both the HDMI In and Out demo projects fail to be created in Vivado 2016.4. However the git clone fails. Could you provide a screenshot of the contents of your Arty-Z7-20-hdmi-in repo's /repo/ subdirectory? When you say that the clone of vivado-library failed, are you able to provide any more specific information on why or how, like specific error messages? You may need to run "git submodule init" then "git submodule update" in a Git shell within your Arty-Z7-20-hdmi-in repo directory rather than cloning vivado-library directly. This will effectively clone vivado-library into the proper place within the repo, I am not sure that this will work without knowing why directly cloning vivado-library failed. Attempting to run validation of the block design after create_project may also help show where the issues are (F6 keyboard shortcut). I will attempt to reproduce your bug and then get back to you, let me know if any of my suggestions uncover more information. After running through generation of the project and reproducing what is likely your bug (picture attached), it looks like not all of the required files were included in the release zip archive for the project. You should be able to get the project running by cloning the hdmi project repository and using that to follow all steps of the tutorial after downloading and extracting the ZIP archive. Alternatively, the git submodule route I mentioned in the previous post may also work, as long as the git shell recognizes the extracted directory as a git repo. I I did not use the zip files. I cloned the git repos for both cdmi in and out. drwxrwxr-x 8 rpm886 rpm886 4096 Jun 14 13:47 .
drwxr-xr-x 29 rpm886 rpm886 4096 Jun 14 13:49 ..
git submodule init and git submodule update from within the repo directories. It never returns from create so will not sure what "Attempting to run validation of the block design after create_project" will show. Had to reboot and but not sure where to find "validation of the block design". F6 did nothing. So I rebooted after it froze and I was able to generate a bit stream!! But I'm now having trouble. ** Copyright 1986-2016 Xilinx, Inc. All Rights Reserved. This is a new vivid install. I am wondering if this is an OS related issue, I am running Windows 8.1, so this seems likely. Going to have a coworker with an ubuntu VM attempt to debug your issue further. Block design validation would only do anything after create_project has completed. With the submodule fully checked out, there shouldn't be any fundamental problems with missing source files, outside of vivado having trouble with Linux (ubuntu?) file paths, which I don't believe that it does. So I've made more progress but not there yet. For those out there installing Xilinx Vivado & SDK from scratch on Ubuntu 16.04. 13:17:09 ERROR : (XSDB Server)ERROR: [Hsi 55-1452] Error: running open_sw_design. 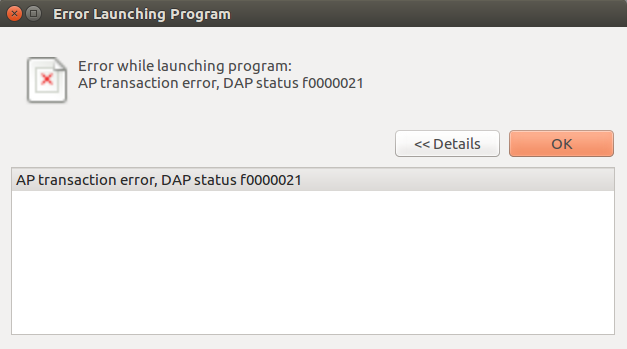 These errors are occuring even when you Generate Bitstream -> Export to SDK -> Launch SDK in Vivado? No I can Generate Bitstream and Export to SDK and SDK launches fine. 13:56:26 INFO : XSCT server has started successfully. 13:56:27 INFO : Processing command line option -hwspec /home/rpm886/Arty-Z7-20-hdmi-out/proj/hdmi-out.sdk/hdmi_out_wrapper.hdf. 13:56:27 INFO : Checking for hwspec changes in the project hdmi_out_wrapper_hw_platform_0. ERROR: [Hsi 55-1452] Error: running open_sw_design. 13:56:29 ERROR : [Common 17-39] 'hsi::open_sw_design' failed due to earlier errors. 13:56:29 INFO : BSP Project P/fsbl_bsp has been successfully migrated. What happens if you right click on the BSP and select "re-generate BSP sources"? Throughout today I downloaded and installed vivado/sdk 2016.4 and ran the hdmi-in for the Arty-z7-20. When you have generated the bitstream and exported the sdk you should move the hdmi-in and hdmi-in_bsp from the sdk folder in to the project folder. Then launch sdk. I then import the hdmi-in and hdmi-in_bsp and you should be ready to go! I have attached my project below. It there something missing from this repo? It loads into vivido fine. I can generate bitstream and export into the SDK fine. I can import the project and program the FPGA. sudo ln -s /usr/lib/x86_64-linux-gnu/libstdc++.so.6 /opt/Xilinx/SDK/2016.4/lib/lnx64.o/libstdc++.so. I'm confused because the FPGA programed fine from SDK but something isn't configured correctly. I found an xilinx forum thread here that talks about this issue. So when you download the HDMI_in/out demo's you also need to download the vivado library folder in the repo folder here(hdmi-in) and here(hdmi-out) as well. Then in your downloaded project you need to put the contents of the vivado library download into the vivado library folder in the repo folder. You know that you have done this correctly when you go into repo->vivado library in the downloaded project and it has the contents from here(hdmi-in) and here(hdmi-out) in it. I downloaded the vivid-library and copied the contents to the repo folder of the projects cdmi_in and out. screen freezes forever and I have to kill the process. 12:11:00 INFO : XSCT server has started successfully. 12:11:00 INFO : Processing command line option -hwspec /home/rpm886/HDMI/Arty-Z7-20-hdmi-out/proj/hdmi-out.sdk/hdmi_out_wrapper.hdf. 12:11:01 INFO : Checking for hwspec changes in the project hdmi_out_wrapper_hw_platform_0. 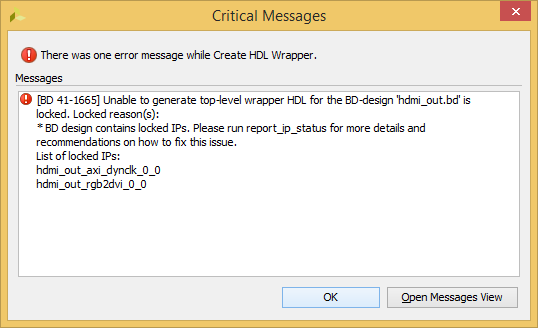 12:11:01 ERROR : (XSDB Server)ERROR: [Hsi 55-1452] Error: running open_sw_design. 12:11:01 ERROR : [Common 17-39] 'hsi::open_sw_design' failed due to earlier errors. 12:11:01 INFO : BSP Project P/fsbl_bsp has been successfully migrated. So I finally got the HDMI_In and out to be created properly AND HDMI_In is finally working!!!! However, Hdmi_Out Demo is still reporting missing IP errors in the SDK. Is the Vivado_Libary repo in github correct for hdmi_out demo? Could you send me screen shots of what your sdk HDMI-OUT project looks like as well as attach your project compressed? I have attached a file that has screen shots of whats in HDMI-IN and HDMI-IN_bsp as well as the what the terminal menu when the board is programmed. I am working on the HDMI-OUT. 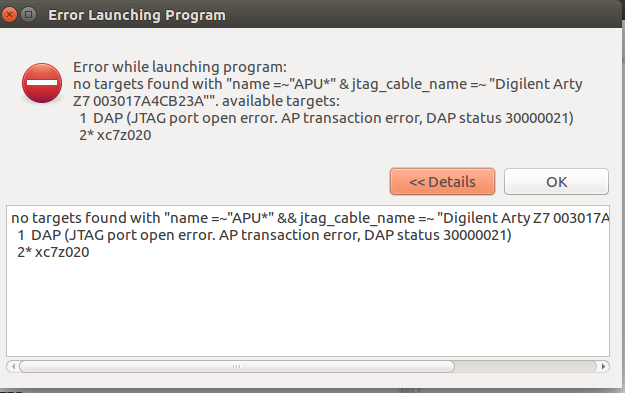 I got similar errors in sdk with the HDMI-OUT in Ubuntu and in Window. I have reached out to the creator of the HDMI-OUT demo about this issue. My zipped up HDMI_Out project is to large to post. The errors I was getting in SDK are posted above. Are there any smaller files I can post that would help? After some research and talking to the creator of the arty-Z7 HDMI-OUT project I was able to fix the issue. We will fix the project on github in the next few days but with the existing project all you need to do is delete the fsbl and fsbl_bsp (selecting the project contents on the disk). Then create a new application. Name it fsbl , select next and choose zynq fsbl and then click finish. I just did this and confirmed that it works on my monitor using tera term.